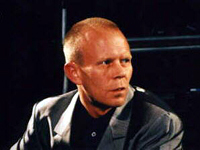 By odd coincidence, Vince Clarke was working on a covers album for Erasure when he ended up remixing Homosapien for Simple Minds' covers album Neon Lights. His remix eventually turned up on the first Cry single as a bonus track, a traditional remix in Clarke's synth-pop style. (Having been part of Depeche Mode, Yazoo and Erasure, his synth-orientated pop should be familar to many). He also prepared a far more radial remix of Homosapien. Jim loved it and so it was retitled The Floating World, the instrumental which closed the Cry album. The song was also issued as an extremely limited 12" under the pseudonym of Taormina.